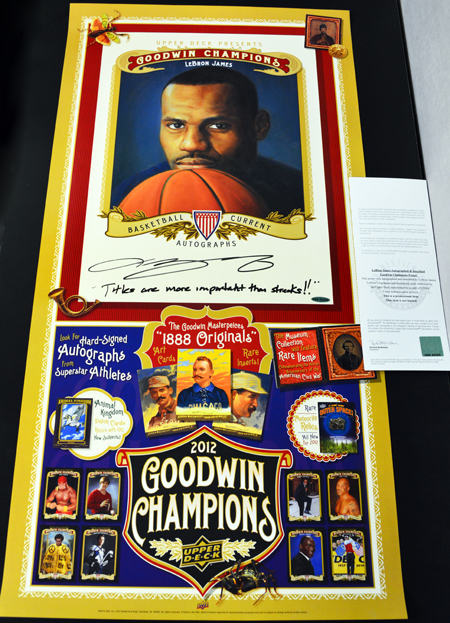 Nominations Are Now Open for Upper Deck’s 2013 Father of the Year Promotion to Score a LeBron James Signed Promotional Poster! It shows LeBron’s focus on keeping his eye on the prize which we continue to see as the 4-time NBA MVP continues his run for another championship during the 2013 NBA Playoffs. This piece will become the immediate talking point to whatever room it is placed in and is truly a piece of history. Here at Upper Deck we are happy to share it with a deserving dad. Upper Deck is offering up one memorable piece of signed memorabilia for the 2013 Father of the Year promotion! Please send a jpeg image of the dad you are nominating collecting Upper Deck or enjoying Upper Deck Authenticated memorabilia with his kid(s). Higher resolution images work best for us. Please visit www.upperdeckstore.com and let us know what memorabilia item from UD’s online store you think dad would most like to receive this Father’s Day and why you think he would enjoy the piece. Emails must be received by Monday, June 17 at 5:00 p.m. Pacific. Upper Deck will select the candidate that most skillfully conveys the fun of collecting with dad in their picture and written submission on Tuesday, June 18 to be Upper Deck’s Father of the Year. Five runners-up will receive an Upper Deck mail day with a free box of Upper Deck cards and some other goodies! There is no cost to participate in this promotion, entry is absolutely FREE! 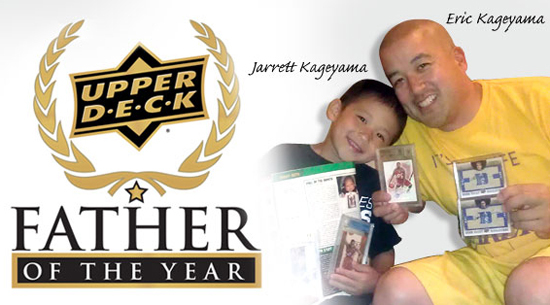 To get an idea of the submission that won last year, meet Eric Kageyama, the 2012 Upper Deck Father of the Year. Eric Kageyama took home the title in 2012. Who will hoist the trophy in 2013??? Feel free to share your images as you get them on Upper Deck’s Facebook page or on Twitter to @UpperDeckSports with the #FOTY hashtag. And remember you have through the Father’s Day holiday to get your images so make sure to give dad with some Upper Deck product this holiday and snap a photo of him enjoying it with the kids! Get that off to us that day or Monday and he could score big!